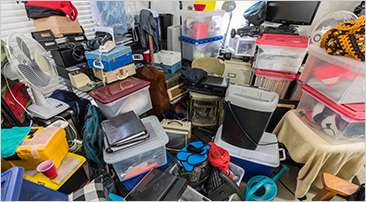 This situation usually occurs when a loved one passes away or an elderly family member is in need of full time care and relatives are left with the daunting task of clearing the massive amount of clutter collected in the residence over the years (hoarding). We have seen it all from mountains of newspapers and clothing waist deep to random items and garbage piled to the ceiling. Our friendly staff will come in and professionally clear all the clutter so you don't have to deal with the massive project at hand. BEE JUNK FREE offers Hoarder Cleanouts and other Junk Removal Services to clients across Peterborough, Lindsay, Port Hope, Cobourg, Bowmanville, Courtice, New Castle, Kawartha Lakes, Campbellford, Whitby and Oshawa, ON.